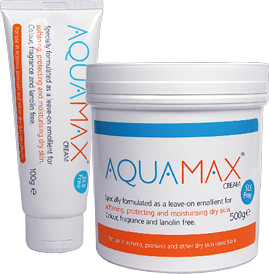 Specifically designed 1) to help soothe & hydrate and 2) for use in eczema, psoriasis and other dry skin conditions, Aquamax is 100% free of sodium lauryl sulphate (SLS), the heavy-duty detergent still commonly used by some of the best-known skincare brands. Our gentle formula means it’s okay for your whole family to use and it’s more affordable than many rival emollients too. Available now at your local pharmacy or on prescription direct from your GP. I am using your cream and it's been a lifesaver. So soothing and easy to rub into already inflamed, delicate skin. I'd recommend it to anyone with a dry skin condition where you want it to last all day.